Below is a list of our strings on hand and the prices to string your racquet with that string. Any string can be added to our inventory within a few days. 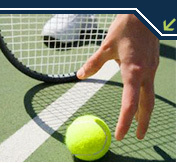 If you already have the string, bring it in and we will string your racquet for only $14 (hybrid string jobs are $16). Do not hesitate to call or email us if you have any questions. Strung Price: This is the total price you pay to have your racquet strung with a given string. There are no other costs! Estimate: Can't find the string you are looking for? Get an estimate on any string. We can have it in stock within a few days. Fill out the form below. Straight forward nylon string. This thicker 15L gauge string is more appealing for durability and price than playability. But don't let the price fool you, this is one of our most popular strings we offer. The #1 selling string in the world. Something for everyone: good playability, good durability, good price 16 and 17 gauge. Exceptional all around performance and playability for the cost. One of the most popular 16 gauge strings ever. Wilson's durability-oriented synthetic gut offers longer life without sacrificing power and feel. Available in multiple colors. Large wraps around a solid core give this string a texture designed to bite the ball for more spin. Duraflex is added to increase durability. Durable, textured synthetic gut for added spin. Highly recommended for spin potential. Great value in a multifilament string. Winner of the USRSA's 1994 String Survey for #1 playability synthetic. Not recommended for string breakers. Most popular polyester string from Germany. Offers great durability without the stiff feel of kevlar. An advanced Polyester tennis string designed to offer increased control, comfort and playability. Good tension maintenance compared to traditional Polyester strings. An all around performance string combining Poly/Nylon Fusion and Powerfoil technology for unmatched power. One of the most textured strings on the market. Great for drop shots, slice and topspin. Wilson's #1 selling string. Excellent playability and feel using Wilson's proprietary Xycro-micro fibers. This popular hybrib combines the durability and bite of the 17 guage Gosen Polylon Ice, with the great feel and response of Wilson Sensation 16. Popular durabilty hybrid. Textured outer wrap on kevlar mains provide increased spin and feel. Combined with a Synthetic gut crosses for extra feel. Ultra-responsive with excellent feel. Gamma's best selling string. Wilson NXT uses Dupont Xycro Micro fibers along with polyurethane resin and coating for increased feel, comfort and playability.